The more I play of War Brokers, the more I come to appreciate it. It has a number of different game modes along with a recently released Battle Royale mode that's actually quite fun. After I previously wrote about it, I discovered Unity input bugs affected it and reached out to the developer. One day later, it's already fixed for us with an updated version of Unity. That's what I love to see, that's how you do good Linux support! Package Retrieval - Collect a suitcase that drops from an aeroplane and then deliver to a drop off point. Defuse - Find the three bombs the enemy plants, against a timer. Survive - A free for all that only gives you a pistol. 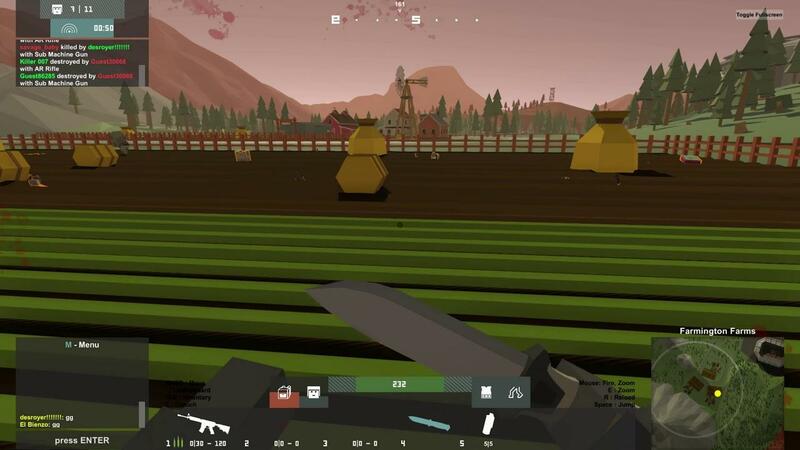 Battle Royale - a free for all against up to 60 people, collect weapons and equipment as you explore. The Battle Royale mode has an interesting mechanic for the map, where the play area will grow in size depending on the amount of players. It's a clever feature, since you won't always find games with tons of people. If you're worried about player count, I've never had trouble finding a game so far. Find it on Steam for £8.29/$10.99. You can also try it in your browser here with some adverts (and an FPS cap), so the Steam version is a superior experience. Now you've got me remembering 80's Canadian ska/reggae/rock band The Hopping Penguins. Gotta go listen to some of that. Would be great to see these sort of games support bots. I know it's alot of extra work, but it helps keep it alive. I think this looks like an awesome game, will probably buy soon! Seems much better than CJ.